It’s almost impossible to get to the moon. It’s out in space, which is dark and empty, and it’s very far away. If Anna and Crocodile are going to make it to the moon, they’ll need some special skills, like being able to do math and having a lot of patience. They’ll also need to build a rocket. Not to mention the sandwiches for the journey. Luckily, when Anna and Crocodile put their minds together, nothing can stand in their way. Full of the same cheerful charm that made How to Find Gold so endearing, Viviane Schwarz’s pitch-perfect text and wonderfully colorful illustrations launch this story off the page in a true celebration of curiosity and the magic of imaginative play. 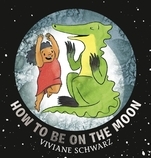 In the follow-up to How to Find Gold, best friends Anna and Crocodile are going on another intrepid adventure — this time, to the moon. Viviane Schwarz is the author-illustrator of the acclaimed picture books There Are Cats in This Book and There Are No Cats in This Book, both of which were short-listed for the Kate Greenaway Medal, as well as Is There a Dog in This Book?, How to Find Gold, and the Tiny Cat books. She lives in London.